In Faith seeking understanding Karl Barth (1886-1968), like Malcolm, Hick and Plantinga, focused on the ontological argument's importance for the person with pre-existing faith. For Barth, Anselm's arguments should not be seen as such - they begin and end with a prayer, an address to a God who is already accepted to exist. Barth sees Anselm's negative definition of God as that than which nothing greater can be conceived is actually a revealed "name" of God, which Anselm sees as a norm of theological thinking, one which reinforces the limits of human understanding rather than assuming that humans can fully understand God. Barth sees the assertion of God's necessary existence in Proslogion 3 as an admission of the total dependency of contingent beings, such as ourselves, on the creator, rather than as a clever "sleight of hand trick" (Schopenhauer). He concluded: "The reason why there is such a thing as existence is that god exists. With his existence stands or falls the existence of all beings which are distinct from him. Thus with the prohibition against conceiving anything greater than him and with this prohibition ruling out the thought of His non-existence - thus alone does God confront man. Thus he and he alone is objective reality." This observation of Barth's is strangely reminiscent of a little-known but distinctive ontological argument put forward by Immanuel Kant in his pre-critical work "The only possible argument in support of a demonstration of the existence of God" (1763). He dismissed the possibility of a classical argument working from a definition of God's nature, using an early statement of his later criticism "existence is not a predicate" based on his reading of Hume. Yet he supported the idea of a proof for God from general ontology to a certain extent. In the Critique of pure reason (1781) he waters this down somewhat to fit in with his general epistemology and to ‘leave room for faith', he leaves the impression that it may provide grounds for belief beyond the postulation based on "the moral argument". This little-considered version of the ontological argument works not from a definition of God but rather from a definition of reality, of being itself. If reality is to be possible (i.e. not contain a contradiction) it must contain an explanation of itself and yet if our understanding of reality is limited to our contingent experience then this is not forthcoming. There must be that which explains contingent experience, which makes reality possible. "Accordingly, there must be something whose nonexistence would cancel all internal possibility whatsoever. This is a necessary thing." Kant here sees that God could be the material ground of possibility. This argument shares a lot with Aquinas' Third Way, though it is recast as a deductive proof rather than an inductive argument. 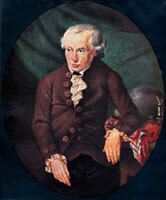 Kant firmly dismissed the inductive version along with other cosmological arguments in the Critique of pure reason, but is more intrigued by the "only possible argument". 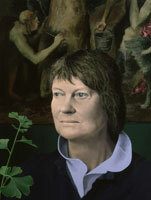 Iris Murdoch (1919-99) is best remembered as a novelist and through the story of her struggle with Alzheimer's, which was told in the film Iris with Kate Winslet and Judi Dench. She was, however, also a respected philosopher and literary critic, holding the unusual position of being a modern Platonist. She maintained that ideals such as goodness, beauty, truth have a real existence - though she stopped short of ascribing them to any definite ‘world of the forms' outside the mind. Although no obvious theist, she was fascinated by the ontological argument as she saw in it a way of reaffirming the connection between well-known concepts of power, knowledge, love etc. and the concept of god as supreme perfection. As she saw, it the ontological argument is primarily a faith-exercise which helps the individual to accept the reality and coherence of goodness, of God, within their own lives. In The metaphysics of morals Murdoch recounted a story of believers praying to a relic that was, in fact, a dog's tooth. Through the veneration it is given by the sincere villagers, the tooth begins to glow, it becomes the miraculous relic they think it is. "Here we may make sense of the idea of loving good. At its highest point, love is a determination to create the being which it has taken for its object." Here indeed we come back to the Ontological Proof in its simpler version, a proof by perfection, by a certainty derived from love. The good artist, the true lover, the dedicated thinker, the unselfish moral agent solving his problem: they can create the object of love. The dog's tooth, when sincerely venerated, glows with light." Murdoch takes the same theme in her novel The Sea. The worshipper endows the worshipped object with power, real power not imaginary power, that is the sense of the ontological proof, one of the most ambiguous ideas clever men ever thought of. God is all-powerful and all-knowing in that he defines every aspect of our understanding and by applying our understanding we affirm his existence in every thought. "There is no plausible 'proof' of the existence of God except some form of the ontological proof, a 'proof' incidentally which must now take on an increased importance in theology as a result of the recent 'de-mythologising'." Although Arthur Schopenhauer referred to the ontological argument as a "sleight of hand trick", as a "charming joke" and although, more recently, Graham Oppy concluded that ontological arguments for God's existence are "completely worthless", it retains value. As a logical exercise the argument demonstrates a great deal about language, and as a meditative exercise the argument has the power to affirm personal faith. Perhaps, as GE Moore once remarked, "The lot of critics is to be remembered by what they failed to understand."